As promised, I prepared a second half-batch of fake turkey to bring to my family's Thanksgiving dinner. I used the recipe found here. If anyone out there is keeping track, I used a different basting broth this time - I picked up a pre-made chicken-style vegetarian broth instead of using broth powder, and just used a cup of it (instead of reconstituting the powder). Otherwise, the ingredients were all the same as the last time I made it. The biggest difference was the method. Fake turkey #1: "Mix the Wet Mix ingredients in food processor until smooth. Add the Dry Mix and process briefly until it forms a ball on blade." Fake turkey #2: "Mix the Dry Mix ingredients in the bowl of your electric mixer with dough hook attachment. Add the Wet Mix and knead for about 10 minutes. Let rest for about 1 hour, covered. Then knead it for 10 more minutes." Mini food science lesson: all this extra kneading serves to develop the gluten, forming stronger protein bonds, and making a chewier end product. This is the same reason that, say a baguette is chewier than banana bread. More handling, more gluten development. During the mixing phase, I ran into some trouble. The half batch was a little too small to work well in my mixer. It just sat at the bottom of the bowl while the hook passed harmlessly over top of it, slightly indenting the dough, but doing no actual kneading. This led me to a long stretch of hand-kneading. I'll tell you - twenty minutes of kneading something that smells as weird as this did is... let's call it unpleasant. I wish my mixer had been up to this task. Skipping to the end now. I wound up, after an eternity of cooking (used method #2), a kind of yellow-gray flat loaf. I wrapped it up, and stashed it in my fridge to bring down to my parents' house in a couple days. Thanksgiving rolled around, and I tried to get my family psyched up to try this... thing I brought. They were willing to try it. For science! I warmed it up in the oven, which took about 30 minutes at 375 degrees, then sliced it and attempted to fan it out attractively on a plate. It didn't really work. The slices were too short to fall over, thus creating a fan, so they just kind of sat there, gray-ish and a little slimy. I boldly carried it out to the table anyway, and handed it to my wife with a flourish ("ta da!"). Everyone took a deep breath, and put some on their plates. My mom asked how I wanted this thing evaluated, because she had some immediate thoughts on its appearance. She declared the color to be "scary". My brother said it looked more like bread than turkey. Brother: Unnecessarily rubbery, with a bread-like flavor. "I would enjoy this if it were, in fact bread, but unfortunately it is not." Mom: (she had a lot to say about it) "I'd only eat this if I had no other choice" (which I think we determined to mean no other food, not just no other meat), "just foul - with a 'u' not a 'w'" (my family has a very pun-based sense of humor), "just say no", and described the aftertaste as "hanging" with a "plasticky" flavor, and declared milk didn't get rid of it. (My dad and I managed to wash the aftertaste away with wine, and my brother determined cranberry sauce also worked. We think it was the acid in the wine/cranberries.) Also, she said if she was grading this on a scale of 0-10, she'd give it a -1. Wife: "Similar to last time, but wheatier and less edible", and "by far the least tasty thing on the table." For my part, I'd say that it was definitely chewier than the first attempt, but nothing even remotely like meat. Maybe if someone hadn't eaten meat in at least a decade, they could be tricked into thinking this was meat-like. The flavor was very different than the first one I made. I was hoping that the chicken-esque broth would give it a better flavor, but it did not. It added no flavor at all, really, which puzzles me. Something else we noticed - the wheat-like flavor of this fake turkey overwhelmed most other items on the plate, including gravy, and even cranberries. With mashed potatoes, the flavor mellowed a little, or maybe it just diluted it. Also, Mom tried to feed a little bite of it to the cat, who, despite not having eaten since that morning, didn't even smell it - she preferred the crumbs of leftover food from the morning. My family found this hilarious. I just realized I haven't said anything about the actual turkey, since this is a head-to-head post. My dad cooks the turkey every year on the grill (even in the snow here in Minnesota - I have a picture of that somewhere...), and it always turns out super juicy and flavorful. No change this year, and we all figured the fake meat turkey would have absolutely no shot at winning this contest. But at least we all tried it. For science! I was informed, today, that my cousin Jill had found almost the exact same recipe somewhere else and was planning on trying it out this year. I took a look at her version of the recipe, and found that, while the ingredients were the same, the directions were COMPLETELY different. So significantly different, that I'm strongly considering trying that version, since it will have a completely different texture than the one I made. An example of the differences: my version used a food processor to combine the ingredients briefly, until they formed a ball - the other version involves a total of 20 minutes of kneading! Since I've got all these leftover ingredients, I might as well. Maybe I'll make it and surprise my parents with it for Thanksgiving. "Here folks - I brought this to compare with the turkey you guys prepared. How about a quote for my blog?" Actually... do I hear the next head-to-head post calling? Finally, we come to part 3 of my Fakesgiving holiday extravaganza. For the third part, I've got something very different. I've got a homemade fake turkey...loaf. Roast? Blob? Whatever you want to call it, I made it. I tried to take pictures, and I got a couple of process pictures, but my camera is bogus, so the finished product pictures didn't turn out very well. What you see in the corner of the page is the plate with a slice of each of the three fake meats. The Quorn Turk'y Roast is on the right (that's the pale, white-meat-looking, perfectly round one), on the left is the Tofurky roast with hideous stuffing in the center, and in the middle, looking vaguely phallic (sorry - unintentional) is the slice of homemade fake turkey-loaf. I'll put the recipe at the bottom of the review, in case you want to try it yourself. The process of creating this wasn't too traumatic. I had to go to my local co-op to get many of the ingredients, since my friendly neighborhood Rainbow Foods didn't carry many of the ingredients, some of which I'd never used. I did my best to follow the recipe, since we got it from someone who had used it many times before, with good results. One thing I will say - I had some trouble coordinating all three of the roasts, since they all cooked at different temperatures, for varying amounts of time. So if you're going to do this thing, probably just pick one. It'll be easier for you. could actually be tasty, or even remotely resemble meat. But, I went with it, in the name of science! "pleasantly moist and squishy with nice crunchy bits", "bread-like", "texture like soft or soggy bread", "fair amount of turkey flavor, though tastes closer to stuffing", "loafy", "my favorite of the three", "somewhat bready flavor...mushier than I would like", "bitter aftertaste", "texture = spongy - not bad to me", "looks like a loaf of bread I found in a puddle". Common consensus seemed to be that it was relatively pleasant (except for the person who said it looked like it was found in a puddle), although not very meat-like. Most people said it tasted like stuffing, which makes sense, since I put the same herbs into it that people usually use in stuffing. I'm not sure what could be done to make it more chewy and less bready, but there you go. If you are reading this and you make this sort of things a lot, send me some suggestions, or recipes. I have a bunch of leftover vital wheat gluten, soy flour, and a small quantity of nutritional yeast flakes (but I know where to get more), and I'm not sure what to do with it. I'm also not afraid of it anymore, so send me recipes! If there's something you want me to try out, let me know - I take requests. I'm not sure I'd call this a fake turkey item, as it had no real resemblance to turkey. Maybe you could mold it to look more turkey-shaped? If you do that, please send me a picture! Mix the Wet Mix ingredients in food processor until smooth. Add the Dry Mix and process briefly until it forms a ball on blade. Remove and, with wet hands, form into 2 loaves. Place each loaf in an oiled loaf pan and press down a bit with your hand. Mix the Basting broth ingredients in a small bowl and pour about 1/2 a cup over each loaf. Cover each loaf pan with foil and place in the oven. Bake for 30 minutes, add about half of the remaining Basting broth and bake another 30 minutes, basting the top now and then. Turn the loaves over, carefully loosening around the edges and from the bottom with a small, thin spatula first. Add the remaining Basting Broth and bake about 30 minutes more, basting frequently. The loaves should completely soak up the broth by the end of the cooking time. If they don't, cook until they do. [mine went an extra 15 minutes or so] Remove from the pans and serve or let cool. Can be frozen. Slice this VERY thinly for sandwiches, or you can slice it into 1/4"-thick "cutlets" for scaloppine, into chunks for stews and pot pies, slivers for stir-fries, or oblong chunks for "fried chicken", or other "chicken" dishes, browning first in a little oil. Divide the dough in half and roll each half out on a damp, clean counter with a wet rolling pin to make a circle 15" across, more or less. Mound about 3 and 1/2 c. stuffing in the middle. Sprinkle the top with roasted sesame oil. Fold the dough up around the stuffing in a loaf shape, pinching very well to seal the dough. Smooth into loaf shape and place each loaf in a very well-oiled 9x5" loaf pan. Now proceed as in the basic recipe, EXCEPT make 1 and 1/2 times the Basting Broth recipe. Welcome to part two of my fabulous fake turkey holiday extravaganza! 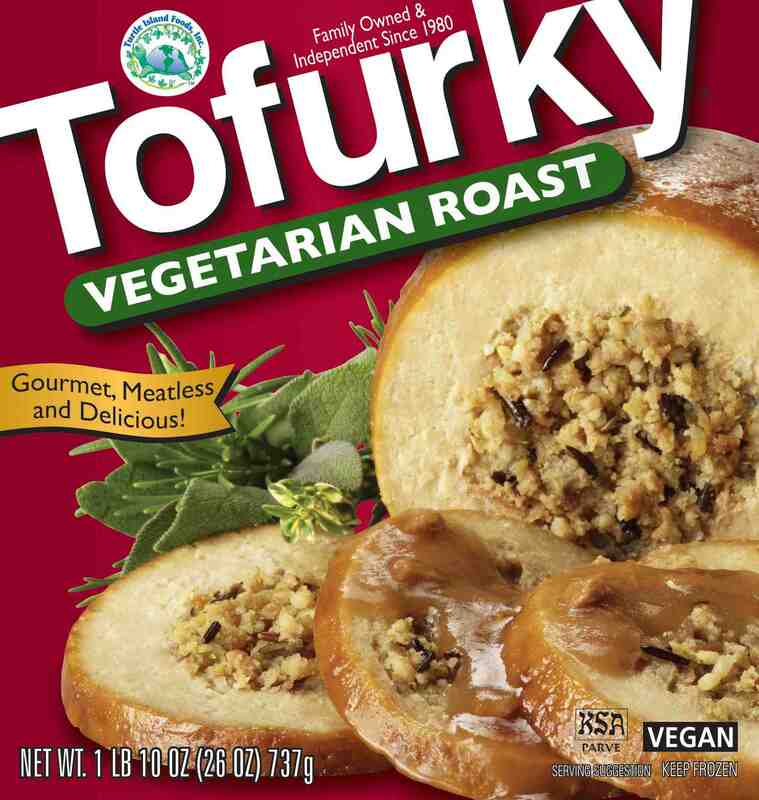 Today, we're going to try out the Tofurky Roast. This is what most people think of when they think fake turkey. At least, the people I know. 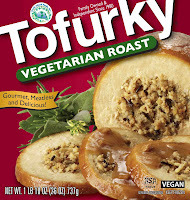 According to the website, "Tofurky Roasts have been America's original and best selling alternative to turkey" since it was introduced in 1995. It must be good, if people keep buying it, right? Let's find out! I got the plain roast, with no extra fixings, since we'd already planned for all that stuff. Also, even though the website doesn't show it, I got the one that doesn't even come with gravy. Just the roast. Nothing fancy. Again, I'll compare the website's promises to our experience. The website lauds, "its savory flavor and meat-like texture." Sounds a little more realistic, in my opinion. Savory flavor, meat-like texture. Let's see what the diners thought. "well salted", "taste was ok but rather 'fake meat'", "it tries to taste like turkey", nice savory flavor", okay, not great", "A-", "B+"
"chewy...not meat-like, but this is a feature for me, not a bug", "spongy texture", "more rubbery - closer to meat texture than the others but squeaky", "best texture [of the three]", "meaty texture", "D"
The bottom of this roast got really tough and hard to cut through. I think in the future, I would rotate the roast as it cooked, even though the directions said nothing about turning it. Also, the website doesn't talk about the stuffing inside this roast, and none of the other reviews I found online discussed it. I feel it deserves a mention. Here are some comments on the stuffing: "stuffing is very gluey and unpleasant", "stuffing=icky", "I like the stuffing ok", "stuffing: D". I'm surprised nobody else even mentions it - that was one of the few items on my plate that did not get eaten. Almost nobody ate the stuffing out of the middle of this roast. When combined with the sides, this was actually fairly pleasant to eat. I'd eat it again, although if I could find one without stuffing in the middle, I'd prefer that. Here's the gravy recipe I promised. This works just as well with chicken stock or beef stock as it does for vegetable stock. I'd use red wine instead of white wine for a beef gravy, but otherwise everything is the same. First melt your butter in a saucepan, then add the flour. Whisk together, making sure there are no lumps of flour. Using a whisk is really important for this, so make sure you have one. Once the flour and butter cook together a few minutes (just enough to get the starchy taste out), add the wine, whisking constantly. This will bubble up and hiss a bit - just keep whisking, it'll be okay. The wine will thicken up considerably, very quickly. Once the wine is fully incorporated, add the broth, again, whisking constantly. It'll look a little weird for a few seconds, just trust me. Once the broth is fully incorporated, this is where you get to be creative. Add your spices, and the salt and pepper, tasting as you go, to make sure it ends up where you want it. Once it's delicious, you're done! If it seems a little too thin, let it simmer, uncovered, for a little bit, stirring occasionally to prevent a skin from forming - it'll thicken up a little as the water evaporates out. This week, I'm reviewing The Original Gardenburger. I had a different review written this morning, but it was really boring, so I'm eating a Gardenburger for lunch today. Just for you, dear readers. Now, Gardenburgers (at least this one - I haven't inspected their entire line) aren't really intended to be like meat, I assume. I infer this from the fact that these aren't made from a soy product, and make no claim to being like meat. It's mostly mushrooms, with some rice, some cheese, and then a jumble of seasonings and flavorings and miscellaneous other stuff. I cooked one up, using the stovetop method. Tossed it into my super amazing nonstick skillet, and heated it up. Not sure if I let it go for the full 5 minutes on each side that the directions called for, but it ended up hot. Works for me. I applied burger to bun, added some ketchup (after a first tentative bite to see if it would work with ketchup), and went to town on it. Flavor - pretty bland - good base for making it whatever you want. I was surprised that this didn't taste at all mushroomy, considering how many mushrooms were involved in the production of this product. So, if you don't typically like mushrooms, don't be afraid to give this a shot.